(Release Date: March 25, 2014)  One can tell almost instantaneously when he or she is gazing upon the work of a talented filmmaker, the kind who has a natural artist's eye and does more with his mise en scéne than just instructing his director of photography to point and shoot. Larry Fessenden is someone who knows how to make a movie, but in the case of "Beneath" his screenwriters, Tony Daniel and Brian D. Smith, have let him down. A minimalist survival hybrid blending "Jaws" and "Mean Creek," the film features some frighteningly believable practical effects work and a perceptive set-up as all of the characters are introduced. And then, by the halfway point of the 90-minute feature, the soapy, erratic contrivances of the plot send things straight down the drain. It has been quite a while since a motion picture as initially promising as this one has fallen apart so irrevocably. To celebrate the end of their high school experience, a gaggle of recent graduates decide to go on one last outing together before they are to head in separate directions. Spending the day boating on the seemingly tranquil Black Lake sounds like a peaceful, fun-loving experience, but only the introspective Johnny (Johnny Depp lookalike Daniel Zovatto) has any clue that these waters might possibly contain a giant bloodthirsty fish. Is the legend a hoax? Before the afternoon is out, this question will be answered as the razor-toothed creature claims its first victim and the remaining friends lose their oars and become stranded on their damaged, slowly-sinking boat. Desperate to survive, they turn on each other as relationships splinter and unspoken hang-ups and betrayals are revealed. "Beneath" is a maddening thriller. If Larry Fessenden had simply made a killer fish movie in his signature astute style, he would have been onto something. The villain of the piece is unforgettable, made all the more effective because he is a lifelike mechanical creation and not the result of CGI. There is high tension to be had early on, particularly since the characters have been set up enough to care about them. The second disaster strikes, they turn into petty, whiny assholes who deserve whatever twisted fate is coming to them. Performances are a very mixed bag as emotions are heightenedGriffin Newman overacts to a painful degree as the camera-wielding Zeke, while Chris Conroy and Johnny Orsini might as well be stroking mustaches the whole time as megalomaniacal brothers Matt and Simon. Instead of caring about the situation at hand, the viewer grows increasingly annoyed by all the argumentative interplay and ridiculously strained developments. The characters never look very far from shore, so why do they not make any headway? Furthermore, wouldn't it be smarter for them to just collectively swim for it? 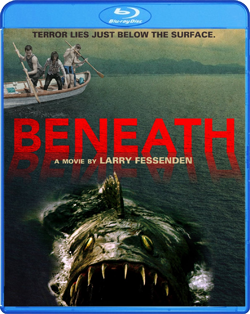 "Beneath" is well shot and technically competent. It's also a bit of an insult to the viewer's intelligence. "Beneath" looks snazzy and as brand-new as it actually is in its 1080p rendering. Shot digitally, the film has a hot, vivid look to its image. Colors radiate, while the sceneryat once idyllic and threateningholds a clear, grab-out-and-touch-it dimensionality. There is one ultra-brief anomaly of judder in an early scene where the friends' car zooms down the road, but otherwise this is as good as the film will likely ever hope to get. The 5.1 DTS-HD Master Audio is palpable and full, particularly when the music score picks up momentum. Dialogue is clear and effectively mixed into the soundtrack. Well done. There is virtually nothing to criticize about Scream Factory's high-def release of "Beneath" (produced by Chiller Films and Glass Eye Pix) outside of the film itself, which loses its way with lackluster writing. Special features are impressive and plentiful, with an entertaining commentary track and an informative, fly-on-the-wall one-hour documentary, so those are definite plusses. If you are a fan of any and all water-based horror stories, then "Beneath" is worth picking up. For everyone else, the frustrations within the movie itself make this closer to a rental. Let's split the difference and give the Blu-ray as a whole a mild (but cautious) recommendation.